A research team from the Korea Institute of Science and Technology has just come up with a novel solution to the graphene problem: no graphene! While graphene has practically limitless uses in solar power and other clean tech applications, the finicky material is difficult to work with, and the hunt has been on to find more compliant substitutes with similar properties. Plastic “graphene” nanosheet ( courtesy of KIST). For those of you new to the topic, researchers at the Energy Department’s Berkeley lab describe graphene as “a special kind of semi-metal.” It is simply a thin sheet of carbon, with thin being thisthin, as in one atom thin. That nanoscale structure provides graphene with unique electronic properties along with a strength far out of proportion to its size. Since its discovery in 2004, graphene has breathed new life into Moore’s Law, a 1970’s-era prediction that the speed and efficiency of computers will double every two years, as more and better transistors get packed into smaller and smaller integrated circuits. The problem with graphene is that it is notoriously difficult to manufacture at commercial scale, so its potential for application to solar cells has not yet been fully realized. According to the Korea Institute of Science and Technology (KIST), the method of choice so far is an eight-step process that involves creating a slush of graphene flakes, gasifying it, and then using a chemical vapor deposition process to layer a film of graphene onto a metal substrate. After all that, the graphene sheet has to be separated from the metal and applied to another substrate, which makes it vulnerable to nanoscale wrinkling and other unintended modifications that can interfere with performance. As part of the solution, researchers have been racing to find alternative substrates to metal, with quartz (aka silicon dioxide) emerging as a favorite. The KIST graphene solution was to ditch the graphene completely, subbing in a polymer (aka plastic). The polymer, called PIM-1, for polymer of intrinsic microporosity-1, has a “rigid ladder” structure that mimics the classic chickenwire structure of graphene. With their specialty polymer in hand, the team came up with a deposition process that based on carbon fiber rather than gas. The KIST process consists of only two steps. First, a thin layer of PIM-1 is spin-coated onto a quartz substrate. Next, it is subjected to a heat treatment at 1,200 degrees centigrade, and Bob’s your uncle. ITO, btw, refers to the layer of indium tin oxide typically used in conventional organic solar cells. If this is starting to sound an awful lot like an organic solar cell (aka a solar cells based on a polymer instead of silicon), that’s basically what it is. While silicon is still the gold standard for solar tech in terms of efficiency, organic solar cells can trade that off with lower costs and greater flexibility in application, including transparent solar cells. The KIST team is not alone in hitting upon the idea of transferring graphene characteristics onto organic solar cells. 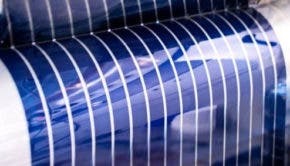 You could also end up with a souped-up organic solar cell that incorporates graphene itself, a route being pursued by a Singapore research team.